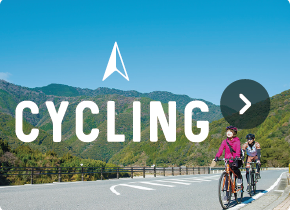 We’ve put together a selection of maps showing principal cycling routes in the Ishizuchi Mountain Range. Each indicates the amount of time needed for the route, as well as details such as the level of hill grade intensity, so please refer to it when making your cycling course selection. PDFs with course data are available for downloading, plus GPX files that will be helpful during your ride. Savor the delicious water and sweets of Saijō! A Gourmet Course! Starting at the Mount Ishizuchi Highway Oasis, this course takes you around through an urban district while offering views of Mount Ishizuchi. You’ll get a taste of Saijō culture along the way, with its famous “uchinuki” spring waters, as well as popular sweets and locally-grown fruit to sample. You can also rearrange the starting point to take a shortcut. This hilly ride starts at the Tōyo-kō Port Ferry Terminal and crosses the prefectural border while offering views of the clear-flowing Kamo-gawa River for your enjoyment, then aims for the Konoka Michinoeki Roadside Station. Once you’re out on the mountain roads there will be no shops or other facilities around, so be sure to come well-prepared. This circuitous course starts at FURUIWAYASOU. On this route, you can enjoy a landscape with villages bordering mountain woodlands and the challenge of a slightly sloped roadway. The FURUIWAYASOU Lodge, a sort of cyclist’s oasis, also offers bicycle rentals. This course starts from the Omogofurusato-no-eki Station and takes you along a hilly road between mountains, aiming for the Omogo-kei gorge with its glittering emerald green waters. With its scant elevation change, this is an easy route for beginners as well. This course leads you on an enjoyably free-drifting cycle trip around sightseeing destinations, starting out with a bicycle rental at the JR Ino-eki Station. Riding along the Niyodo-gawa River, you’ll be able to experience the leisurely flow of the river together with the history and culture of Tosa washi paper-making. This course is recommended for beginners who will be able to ride along carefree, as the course features scant elevation change. This course offers the enjoyment of riding along hilly roads while also experiencing “Niyodo Blue” at spots like Nikobuchi. Along the way, you’ll also have a chance to stop in at the Hibihara-shūraku settlement, which the film “Village of Dreams” featured as its setting. This course lets you cruise at an easygoing pace along the Yoshino-gawa River that flows through the village, starting at Yui no Sato. 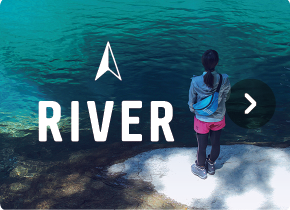 All along the course, you’ll have chances to see scenic views formed by the river’s flow, such as gorges and waterfalls. Taking off from Yui no Sato, this course offers scenery to enjoy at the “water receptacle of Shikoku,” the Sameura Dam. Expect to find a succession of slight ups and downs continue along the way. There will be no shops or other facilities available along the course once you leave the village, so be sure to bring nourishment for yourself as well as plenty of liquids. A route leading to the exhilarating views of the Kamegamori road, known as the “UFO Line,” from the Konoka Michinoeki Roadside Station. From that point, this long-distance course loops back to the starting point at a total distance of 157 km, running along the Ishizuchi Skyline to offer commanding views of waterways such as the Omogo- and Niyodo-gawa rivers. With considerable elevation changes along the way, intense slopes challenge you during both the starting and ending halves. Be sure to exhibit proper caution here — mountain-area roadways tend to be narrow with many dark tunnels, and national highways attract a great deal of traffic. There are many spots that can be your starting point, so have a good time switching it up and choosing your own return route. This is a special arrangement of the Sameura Dam Kokutai course, starting from the Ōkawa-mura Village Settlement Activity Center Yui no Sato. You’ll have opportunities to enjoy the scenery along waterways such as the beauty of the Yoshino-gawa River, which flows between the mountains, as well as the Ōhashi Chōsui-chi Reservoir, Kamiya-kawa River, and so on. There are many dark tunnels along the way, so powered lights will be essential. Also, be sure to watch your speed along the descent to the Gohoku area.